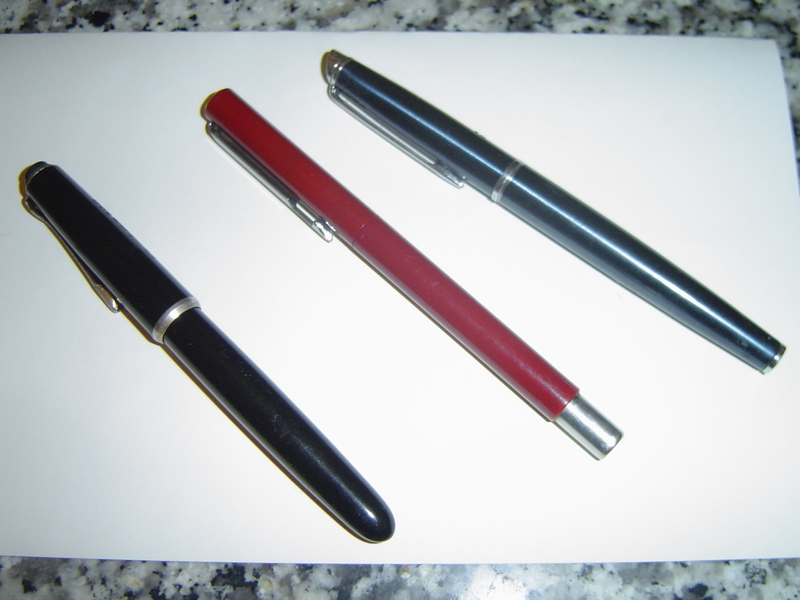 Three fine pens. It doesn’t happen very often that they all come together at the same place. All three are comically modest given my attachment to them. One is a Pelikan 120, a student’s pen that I used when a grad. student in Penn’s Dept. of Folklore and Folklife. As well as class notes, it wrote my exam and my dissertation. It’s seals failed and not even Ron Zorn at www.mainstreetpens.com could put it right. The second was my son Max’s Parker Vector. Telopea Middle School, being the French Lycée in Canbera, required that its sudents use a fountain pen. He still rolls his eyes when we play the French national anthem on Bastille Day. The third is a Waterman Hemisphere, a gift from Max. It tends to dissappear — once in the pocket of a winter jacket across spring, summer and fall. More recently it was hidden for several months, tucked against the front edge of a box of necessary daily items. Astonishing, it was stored there properly cleaned.